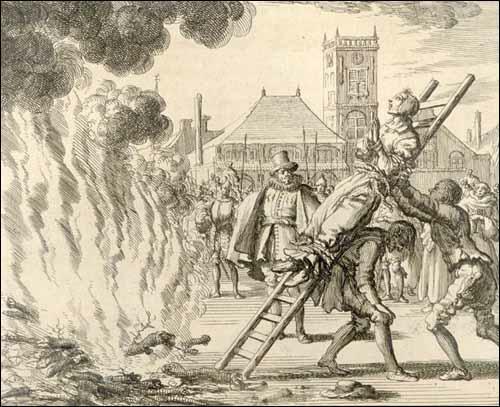 The Anabaptists were persecuted by Catholics and Protestants in Europe. One of its leaders, Balthasar Hubmaier was executed in Vienna in 1528. These ideas eventually spread to England. According to John Foxe, ten Dutch immigrants, Segor, Derycke, Symon, Runa, Derycke, Dominicke, Dauid, Cornelius, Elken and Milo, were burnt at the stake at Smithfield in 1535. Another two anabaptists, a man and a woman, were executed in November 1538. Henry VIII ordered all anabaptists "to leave the realm". Some stayed and three more were burnt at the stake in 1539. Joan Bocher began advocating anabaptist ideas in the Canterbury area. Bocher was arrested and tried for heresy. (Source 2) Passages from the Bible. The Anabaptists not only objected to infant baptism, but also denied the divinity of Christ or said that he was not born to the Virgin Mary. They advocated a primitive form of Communism, denouncing private property and urging that all goods should be owned by the people in common. The Anabaptists... were people who kept their hats on before magistrates and superior officials, refused to swear oaths, whose pacifism made them reject military service, and who were familiar with the gaols of every country in the land. From Germany arrived the first Anabaptists; they believed that infant baptism is not New Testament baptism, and that they were the true elect of God who did not require any external authority. All goods (including wives) should be held in common, in preparation for an imminent Second Coming. In a proclamation of November 1538, they were ordered by the king to leave the realm; those who remained were persecuted and burned. (Source 7) Elizabeth wrote the letter in 1573 from a prison in Antwerp, shortly after giving birth to a daughter, Janneken. Elizabeth's husband had already been executed, and she herself was about to meet the same fate. She was leaving the letter for Janneken, both as a remembrance of herself and her husband and as a guide for her daughter's moral and spiritual development. The true love of God and wisdom of the Father strengthen you in virtue, my dearest child... I commend you to the almighty, great and terrible God, who only is wise, that He will keep you, and let you grow up in His fear, or that He will take you home in your youth, this is my heart's request of the Lord: you who are yet so young, and whom I must leave here in this wicked, evil, perverse world. Since, then, the Lord has so ordered and foreordained it, that I must leave you here, and you are here deprived of father and mother, I will commend you to the Lord; let Him do with you according to His holy will. He will govern you, and be a Father to you, so that you shall have no lack here, if you only fear God; for He will be the Father of the orphans and the Protector of the widows. Hence, my dear lamb, I who am imprisoned and bound here for the Lord's sake, can help you in no other way; I had to leave your father for the Lord's sake, and could keep him only a short time. We were permitted to live together only half a year, after which we were apprehended, because we sought the salvation of our souls. They took him from me, not knowing my condition (her pregnancy), and I had to remain in imprisonment, and see him go before me; and it was a great grief to him, that I had to remain here in prison. And now that I have abided the time, and borne you under my heart with great sorrow for nine months, and given birth to you here in prison, in great pain, they have taken you from me. Here I lie, expecting death every morning, and shall now soon follow your dear father. And I, your dear mother, write you, my dearest child, something for a remembrance, that you will thereby remember your dear father and your dear mother. Further, my dear child, I pray you, that wherever you live when you are grown up, and begin to have understanding, you conduct yourself well and honestly, so that no one need have cause to complain of you. And always be faithful, taking good heed not to wrong any one. In the years after 1543 Joan Bocher's beliefs took an Anabaptist turn.... She was arrested, probably in 1548, and convicted of heresy in April 1549. She was then imprisoned for more than a year, for some of the time in the house of Lord Chancellor Rich, while great efforts were made to persuade her back to Edwardian orthodoxy.... 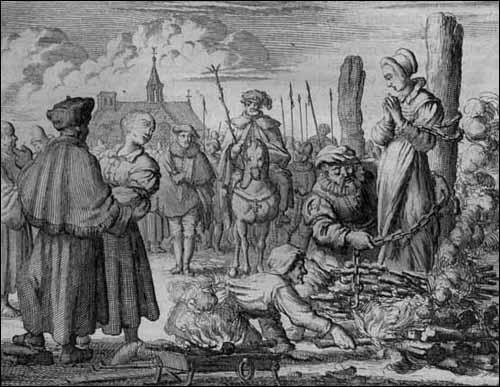 When she remained adamant in her opinions, the privy council decided to proceed with her execution by burning... She was burnt at Smithfield on 2 May 1550, still upbraiding those attempting to convert her... She also asserted that there were a thousand Anabaptists living in the diocese of London. John Foxe, from Boston in Lincolnshire, after graduating at Magdalen College in Oxford, was ordained as a deacon in London and became an ardent Protestant. He had been horrified at the burning of Protestant heretics by Henry VIII, and was very distressed that Joan Bocher was now to be burned under the Protestant government of Edward VI. He thought that her opinions were wrong and shocking, but that the life of "this wretched woman" should be spared; she should be imprisoned in some place where she could not propagate her beliefs and where renewed efforts could be made to induce her to recant. Foxe visited Rogers and pleaded for Joan's life; but Rogers insisted that she must die for her heresy. Foxe said that if her life must be taken away, she should not be burned: "at least let another kind of death be chosen, answering better to the mildness of the Gospel. What need to borrow from the Papal laws and bring into the Christian arena the torments of this dreadful death?" Rogers said that burning alive was gentler than many other forms of death. Foxe took Rogers' hand and said: "Well, maybe the day will come when you yourself will have your hands full of the same gentle burning." Question 1: Read the introduction. Why did the Anabaptists emerge soon after the publication of the Bible in German? Question 2: Study source 2 and explain why most Anabaptists were pacifists (a person who believes that war and violence are unjustifiable). Question 3: Read sources 3, 4 and 5 and then explain the beliefs of the Anabaptists. Question 4: Read source 7. Why was Elizabeth writing a letter to her daughter, Janneken, when she was only a few months old. Question 5: Study sources 1 and 6. How did governments in Europe punish Anabaptists in the 16th century? Why did they use this particular form of execution? Question 6: According to Joan Bocher, how many Anabaptists were there in London in 1550? Question 7: Read source 9. Why did John Foxe try to stop Joan Bocher from being burnt at the stake? How did John Rogers defend the punishment. Did Foxe's forecast come true? By John Simkin (john@spartacus-educational.com) © September 1997 (updated May 2015).